Fast and Friendly Computer Repair specialist. We have several ways of dealing with your IT problems. We will come to you and fix the problem, take your computer to our workshop or you can drop your computer off at our workshop, and of course there is always our excellent remote computer repair services which are cost effective, exceptionally easy to set-up, very secure and simple to use. 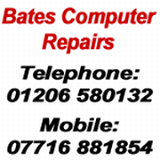 Friendly and Local PC Repairs Company. We Come To You - Home or Office Visits. Free Call-outs (within a ten mile radius). On-Site and Remote Support services.